Rosie is a passionate, funny woman we meet in her mid-thirties and back track over a decade to her early twenties. With a good sense of irony she appears to be completely in control of her domain. She expects a lot from life—for herself and for others. Part of her blames Ben for the relationship ending—he never understood her need for a bigger life. But somewhere in the detritus of her life she recognises she is equally culpable. 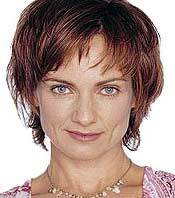 Catherine McClements is well known to television audiences for her starring role as Goldie in more than 100 episodes of WATER RATS. However, since graduating from NIDA in 1985, Catherine’s career has encompassed theatre, television and films and she has featured in over 30 productions. She has been nominated and won numerous awards including a Logie for the Most Outstanding Actress in a series (WATER RATS) in 1998 and an AFI award for her role as Carmen in THE SECRET LIFE OF US in 2001. Although she studied Australian History, and to be a librarian, at Melbourne University, Catherine made a bet with a friend that they should both audition for the National Institute of Dramatic Art. Her friend failed to show up but Catherine went ahead and gained a place at the prestigious drama school. Catherine has worked with some of Australia’s great theatrical directors like Neil Armfield and Aubrey Mellor and her most recent performances include the lead role in Tennessee Williams’ play SUDDENLY LAST SUMMER and as Louise in THE BLIND GIANT IS DANCING, both directed by Armfield for Sydney’s Belvoir Street Theatre. Winner of a Best Actress AFI award for her role in the feature film WEEKEND WITH KATE, she has also appeared in the features STRUCK BY LIGHTNING and THE RIGHT HAND MAN. Catherine played Dinny Weston in the telemovie WAITING AT THE ROYAL and Carmen in Network Ten’s popular series THE SECRET LIFE OF US. This year, as well as Rosie in CRASHBURN, Catherine played David Wenham’s wife in Network Ten’s mini series AFTER THE DELUGE. She played the role of a mother in the art house film, FLOODHOUSE and on stage; she played Lady Macbeth to her partner Jacek Koman’s Macbeth in Company B Belvoir’s production of the Shakespearean tragedy.